Bell’s palsy, or a paralysis of facial muscles of one side of the face, often appears with little warning. Sometimes only after the symptoms appear do patients remember a headache or sinusitis like issues that prefaced the paralysis. Droopy facial muscles around the mouth and eyes, tingling in the tongue, even inability to close the eyelid are common result from Bell’s palsy. It can feel painful and/or numb. The cause is unclear according to western medicine. Most agree there is a viral cause perhaps the same virus that causes cold sores. Happily, most people recover on their own from Bell’s palsy, but it can take 2 symptom filled months for pain to be eliminated. “It feels like I have more strength in my mouth, less droopy”, a recent patient said as I removed 5 fine acupuncture needles from his cheeks. And it should. Acupuncture is sending a message to the facial massages to tighten up, it’s like doing mini sit ups in your cheeks. It makes them more toned and increases circulation. The procedure had taken about 30 minutes, after the initial intake time. 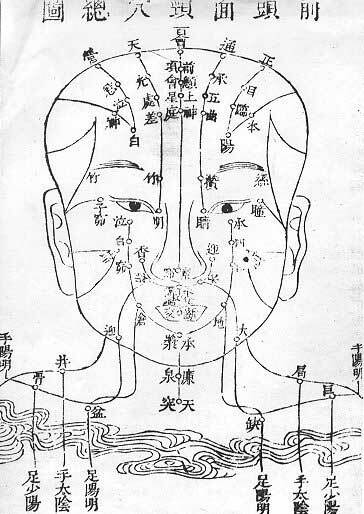 I used acupuncture needles especially made for the face in various acupressure points on his face. I also complemented these needles with points on his arms, legs, and back of his head to eliminate wind. Chinese medicine, a 4,000 year old science, has used nature to explain balance and lack of balance in the body for it’s history. Although we can now loosely translate this terminology into western medical speech, it often resonates with the patient to explain a condition using Traditional Chinese Medical language. In the case of Bell’s palsy, exterior wind is usually the culprit for the symptoms. This is often an exposure to the elements that an otherwise healthy system would manage just fine. But in the case of Bell’s palsy, the system was already weakened and could not handle the exposure. The liver, in Chinese medicine, is responsible for handling wind exposure. In the case above, years of a stressful job weakened the body’s liver and it’s function of controlling the free flow of Qi and eliminating wind was compromised, it allowed the external wind to invade interally. This internal wind caused paralysis of the facial muscles. How Do We Eliminate Wind? If you’ve ever spent time on the top of a mountain and were exposed to cold, cutting wind, what was your natural response? Take cover and try to keep warm, right? This how we treat internal wind as well. In addition to choosing acupuncture points that have the function of expelling wind, we may warm the points with moxa or advise the patient to avoid exposure to wind. We also look at the underlying issue, the imbalance of the liver that allowed the wind to invade and qi to stagnate, and we work to soothe the liver. We advise stress reduction techniques like tai chi and meditation and returning acupuncture visits. At the next visit, one week later, the same patient reported a decrease in tearing of his eyes and numbness to his lips. Overall he was more comfortable and less numb. And, bonus, he noticed a decrease in stress for the week. Consult the acupuncturists at Integrative Acupuncture and Oriental Medicine if you are suffering from Bells Palsy and would like to try an alternative. Words in italics represent Chinese medical terminology and do not necessarily share exact meaning in western medicine.